Tribute albums are a tricky proposition. Play it too close and you add nothing of your own; take too many liberties and you lose touch with the object of your affection. Finding a middle ground that honors the original performances, adds something new and echoes both the celebrated and celebrant is one of the most delicate balancing acts in music. To best accomplish this, you need to have absorbed an artist’s music into your roots, so that your own path of discovery carries the DNA of these influences even as you develop your unique variations. Recorded country music has a long history of meaningful tips of a ten gallon hat, and such is the case for this heartfelt tribute to Buck Owens and Merle Haggard from singer-guitarist Vince Gill and steel guitarist Paul Franklin. 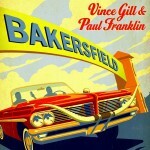 Both Gill and Franklin took to the Bakersfield sound and the songs of Owens and Haggard at very young ages, spurred to dig deeper into music by the revolutionary sounds coming out of Bakersfield in the 1960s. Between Gill and Franklin, they’re able to cover three of the key elements of Owens’ and Haggard’s records: vocals, guitar and steel. Gill’s always had one of the sweetest voices in contemporary country music, but it’s still surprising how easily and equally it lends itself to both singers’ music. He sings his own harmony on the Owens’ tunes, just as Owens had done on his own studio recordings, and adds telecaster sting, including the chicken pickin’ and stuttering leads that bring to mind James Burton and Roy Nichols. This entry was posted on Thursday, August 22nd, 2013 at 4:05 pm	and is filed under CD Review, Free Download. You can follow any responses to this entry through the RSS 2.0 feed. Both comments and pings are currently closed.